Do you like glossy magazines or comic books? Have you ever wondered what makes these forms of reading material so popular and effective? 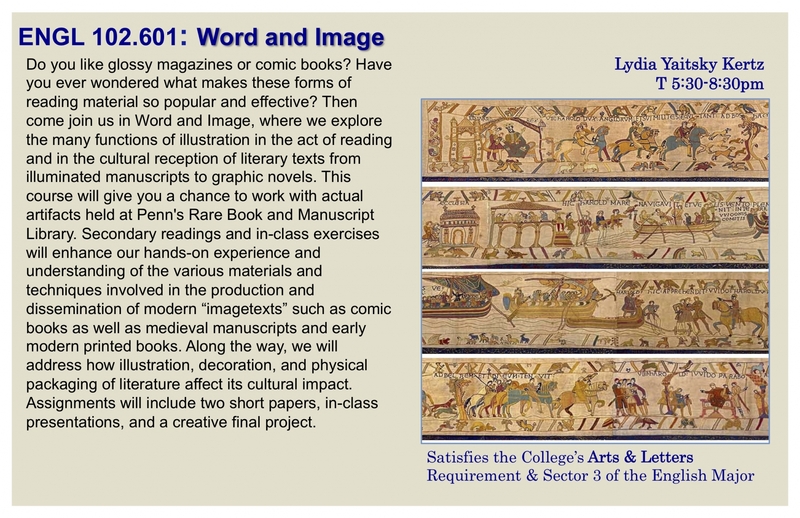 Then come join us in Word and Image, where we explore the many functions of illustration in the act of reading and in the cultural reception of literary texts from illuminated manuscripts to graphic novels. This course will give you a chance to work with actual artifacts held at Penn's Rare Book and Manuscript Library. Secondary readings and in-class exercises will enhance our hands-on experience and understanding of the various materials and techniques involved in the production and dissemination of modern “imagetexts” such as comic books as well as medieval manuscripts and early modern printed books. Along the way, we will address how illustration, decoration, and physical packaging of literature affect its cultural impact. Assignments will include two short papers, in-class presentations, and a creative final project.